Hot air balloon flights have resumed in Luxor, Upper Egypt for the first time since an accident killed 19 tourists in February. Six hot air balloons took to the sky on Sunday morning carrying tourists from England, Australia, Arab countries and Egypt, as well as local governor Ezzat Saad. The president of the Egyptian Federation of Hot Air Balloon Companies said the Civil Aviation Authority would oversee all balloon flights rather than the Egyptian Airport Authority. The change was made after workers refused to supervise flights on Wednesday – when they were scheduled to resume – in protest at the four-day detention of Taher Mahmoud Taher, the head of the balloon flight centre in Luxor from which all flights take off. In March, state news agency MENA quoted Civil Aviation Minister Wael El-Maadawy as saying the company responsible for the accident – SkyTours – would not resume ballooning activities until investigations were concluded. 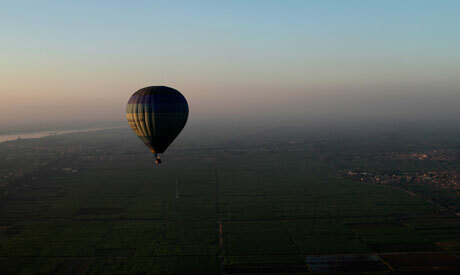 An exploding gas canister killed people from the UK, France, Belgium, Hungary, Japan, Hong Kong and Egypt on a balloon flight in Luxor on 26 February.